America’s favorite frozen high-fructose corn syrup turns 50 this year—an “ICEEversary,” if you will. 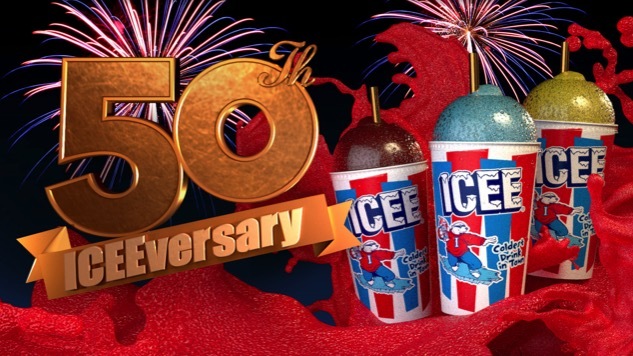 The ICEE company, founded in 1967, plans to celebrate the occasion with a variety of new flavors and fancy-pants golden spoonstraws. Or is it strawspoons? No, definitely spoonstraws. We like to chew on them. Some of the new “innovative and exciting” flavors include Fanta Sour Grape (ick), Dragon Fruit (nice), Laffy Taffy (absolutely not) and Mango Chili Lime (hell yeah!). Dan Fachner, President of The ICEE Company, also hints at a “surprise mystery flavor to satisfy adventurous taste buds.” These will be “rolled out throughout the year in select retail locations nationwide,” per a press release. Apparently, there have been more than 150 different flavors in the company’s history, the strangest of which is certainly buttered popcorn. (Fachner, we swear, if the “surprise mystery flavor” is buttered popcorn, we’re going to lose it.) Instead, we’d like to suggest a coconut rum ICEE. ICEEs for adults. ICEEs After Dark™. In any case, happy 50th, ICEE. One year closer to death!